Our office also handles all misdemeanor crimes. Approximately 1,500 of these cases come through the District Attorney's Office per year. Along with answering phone calls from the general public regarding court dates and other various issues concerning a defendant's charges, the secretaries each have assigned duties. Those duties include processing all misdemeanor criminal files, setting them for court and issuing the necessary subpoenas. 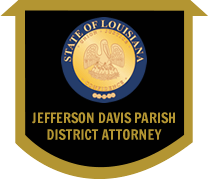 When misdemeanor files are assigned for court, an assistant district attorney takes it to court, at which time the office processes all files in accordance with the Court's action. In addition, this office is responsible for processing all charges relating to Wildlife and Fisheries. The misdemeanors that occur within the Jennings city limits are set up for Jennings City Court, which has its own city prosecutor. Elton, Lake Arthur, Fenton and Welsh have Mayor’s Court that handle minor traffic and misdemeanor offenses.